The Hill and Wang Critical Issues Series: concise, affordable works on pivotal topics in American history, society, and politics. The Green Revolution documents the tremendous change in public awareness and attitudes since the publication of Rachel Carson's Silent Spring. 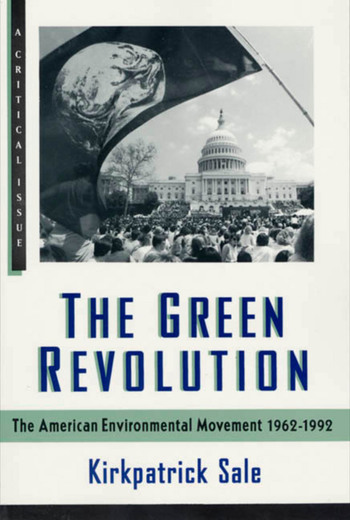 Sale assesses the growth of national environmental organizations and the influence of scientists and their theories about global warming, the greenhouse effect, acid rain, toxic waste, and biodiversity. And he shows how environmental concerns affect all levels of society and much of our government's legislative and regulatory work. Kirkpatrick Sale, writer and lecturer, is a widely respected environmentalist. In addition to numerous articles, Sale has written some half-dozen books, including Dwellers in the Land and, most recently, The Conquest of Paradise: Christopher Columbus and Columbian Legacy.